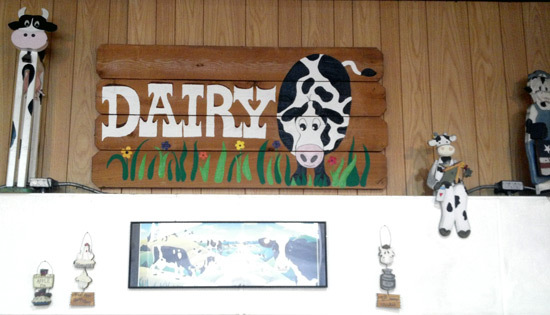 Have a peek at Dairyland and cow heaven at the San Diego Farmers Outlet! I want to start with a quick heads-up. I’m contemplating changing this blog’s template this weekend or next, but I’m really worried it will mess up all of my data with one click of the mouse. If you’ve done it before on WordPress, I’d appreciate any feedback and advice tips you may have! Do you remember when I tried to take a photo of the Farmers’ Outlet store by my pediatrician’s office almost two months ago while I was driving by? Well, if you don’t remember my blurry picture of dairy cows grazing by the farm, you can find it here. This morning we took the kids to the medical office for their yearly flu shot, although I probably should call it flu “spray” since they got the Flumist. My three-year old managed to cry when he got sprayed in the nose twice, even though I’d myself pick that option any day over a shot in the arm, especially with my latest extremely painful experience with a shot. Don’t worry, he got over his crying quickly. After all, he’s only three and bounces back pretty well at this age. We had a little time to kill afterwards and our home needed a refill of fresh produce, so I decided to stop by that farmers’ outlet down the street, especially since they often have great prices on their most common food items. I was delighted to find delicious looking comice pears, my first comice purchase of the season. Comice pears are my very, very favorite pears in the world and I always feel like I’m having a taste of home when I have one. Old, old childhood memories. We also bought potassium-rich bananas and some rep ripe tomatoes. The most surprising thing about this store layout is what you first see when you come in. Right in front of the entrance, across from a short produce aisle, stands the dairy department. The cold fridge area is not that big but I don’t think you can miss it. Look at what’s above it. I present you Dairyland! Is that a lot of cows or what? I’ll let you count them all. The frame at the bottom looks a little glossy on this picture so my husband took a close-up of it below. 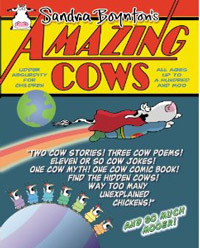 Look, even more cows! Now, I’ll really let you count those. Do the cows look happy to you, or what? Look at them enjoying a little grazing, sunbathing, napping, frolicking, even some swimming in the pond. 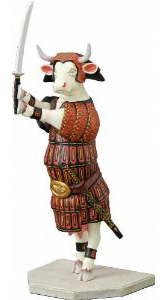 Previous Post Does this sacred cow look sacred to you?